Read Will's review of Ralph Breaks the Internet. In “Ralph Breaks the Internet,” video-game bad guy Ralph (voice of John C. Reilly) and best friend Vanellope von Schweetz (voice of Sarah Silverman) leave the comforts of Litwak’s arcade in an attempt to save her game, Sugar Rush. Their quest takes them to the vast, uncharted world of the internet where they rely on the citizens of the internet—the Netizens—to help navigate their way. Lending a virtual hand are Yesss (voice of Taraji P. Henson), the head algorithm and the heart and soul of the trend-making site “BuzzzTube,” and Shank (voice of Gal Gadot), a tough-as-nails driver from a gritty online auto-racing game called Slaughter Race, a place Vanellope wholeheartedly embraces—so much so that Ralph worries he may lose the only friend he’s ever had. 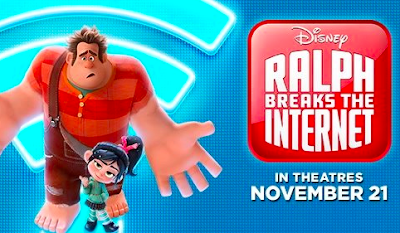 Ralph Breaks the Internet is in theaters on November 21st, 2018. 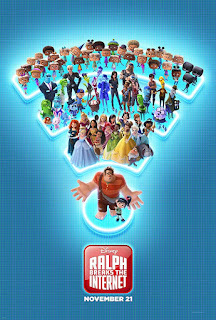 Ralph Breaks The Internet is a definite crowd-pleaser for the little kids and adults alike. Filled with laughs, nostalgia, and great animation design, it’s destined to warm the coldest of hearts. Six years after the original came out, we are given a charming, funny and worthy sequel about the friendship of Wreck-It Ralph (John C. Reilly) and Vanellope von Schweetz (Sarah Silverman). Vanellope is getting bored of Sugar Rush, and even though Ralph does his best to keep the game exciting for her, she still wants more. So when a wifi router get connected at the arcade, Ralph and Vanellope will venture out to try to buy a part before tragedy strikes. While running around in the Internet, they find a dark and grimy racing world, Slaughter Race, where they meet Shank (Gal Gadot) who she thinks is really cool. They also visit a Disney zone featuring characters from many house of mouse properties. The princesses scene is one of the best parts in the movie. It also takes a jab at Disney princess tropes in a mordern interpretation. Besides, seeing the princesses, there are some other cool cameos. The creativity of world building and selection of vibrant colors add a feeling of wonder to it. Its representation of Internet certainly deserves some praise. Internet as technical as it is, is simplified and made in a child friendly and comical way. As we delve into the Internet environment, every scene becomes so busy and full of innuendos. It presents the basic things we always do in our computers and mobile phones. We browse the internet, search, tweet, buy things and all other stuff, we even experience the annoying ads and ad block we use to defeat them. Literal interpretation of things adds more humor to it. Internet traffic represented as car traffic, tweets as birds, virus as literal virus, ads as annoying characters and so forth. John C. Reilly once again gives us a great voice performance. Sarah Silverman with her annoyingly cute voice was great too. Gal Gadot is another standout and scene stealer. She also serves as the voice of reason and a big sister to Vanellope. Taraji Henson as Yesss was good as well. Overall, it might not be as deep as the original but its moral lessons, visual creations and numerous easter eggs and cameos are enough reasons for you to see it. I had a lot of fun with it and it can be a great time with the whole family. On a final note, make sure you stay during the end credits as there is one extra scene. Will (Contributor) has called many places home but now resides in Michigan. An Air Force veteran and avid movie goer who enjoys indie movies just as much as major blockbusters. He is also a technology enthusiast. Click Here to check out Will's Articles.